What Is A SSA-3369-BK Form? Form SSA 3369-BK is a Work History Report. 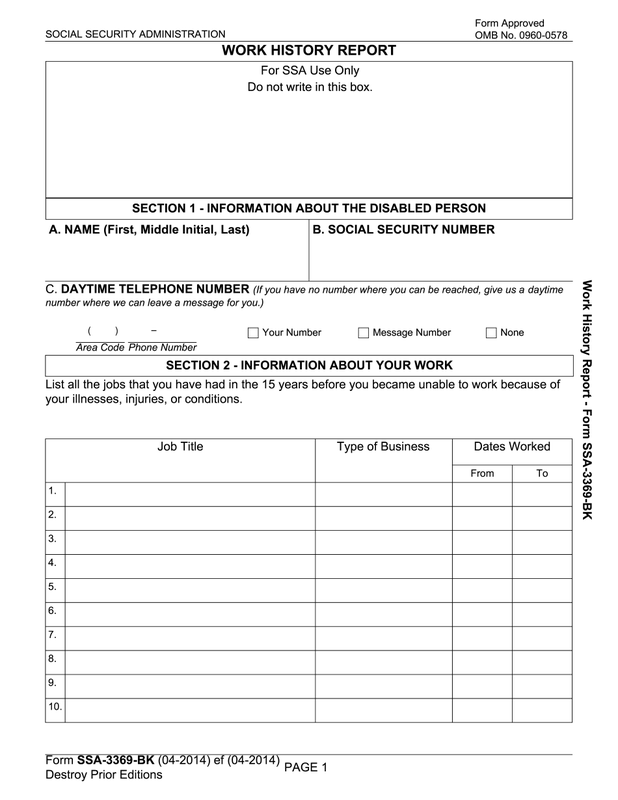 This legal document is usually submitted to the Social Security Administration and helps to determine how your medical condition affects your ability to work in jobs for which you’re qualified. The report shows the responsibilities a person has performed in the past as well as skills and experience he/she has gained during employment. This report helps the SSA to determine whether an individual is able to perform any kind of activity for which he/she may be qualified. The details provided mean not only a person cannot work in the last job, but also that he/she doesn’t have enough knowledge, skills or experience to find job in another area. If you lack of space in other parts of a sample, there is one additional page where you can include all the important data. You also have an ability to edit a blank according to your requirements using various editing tools. Each sample is printable, so you can easily print it out. If you fill out a template online, you can send to a recipient straight from the source by e-mail.